Melanie Klein, left, hugs her mother Nicole Flanagan, center, as they realize Melanie did not get a kindergarten spot at MaST Community Charter School during the school's lottery Tuesday. Nicole's mother, Shannon Flanagan is right. 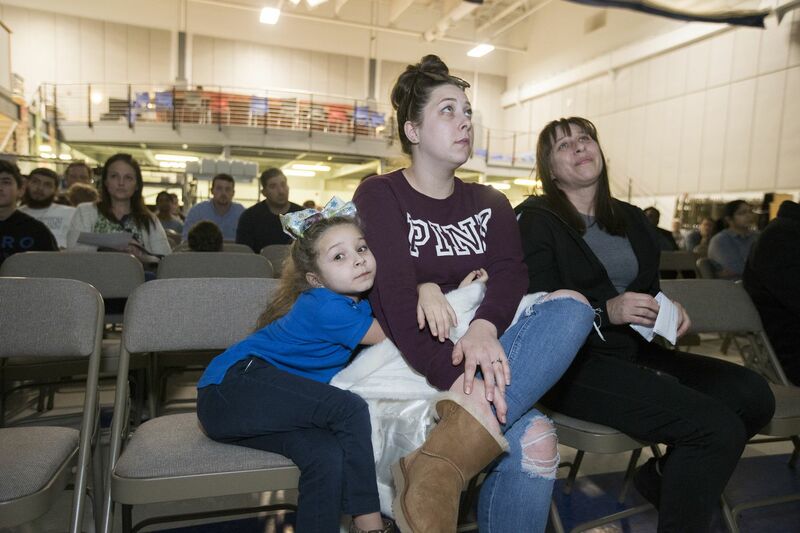 One night this week, parents sat quietly in the MaST Community Charter School cafeteria listening to CEO John Swoyer explain the number of applicants and available seats next year for each grade at the popular Northeast Philadelphia charter. The odds were daunting: For about 45 kindergarten seats — not including those reserved for siblings of current students — the school had received more than 1,800 applications. More than 2,100 applicants were vying for 14 such openings in ninth grade. Riverfront complex, media center, telescope. These are Philadelphia public schools? And first grade? 1,208 applications. Zero seats. Jane Solomon clasped her hands as school officials started the lottery, posting randomly generated names of the lucky students selected for open seats or prime spots on the waiting list. When the winning kindergarten applicants were posted, Solomon didn’t see her daughter’s name. Getting into MaST was one of the factors that would determine if she stayed in the city or moved. Tears in her eyes, Solomon stood and headed for the door. Asked why she didn’t consider her neighborhood public school an option, Solomon looked surprised. Publicly funded but independently run, charter schools have become a loaded issue for politicians and policymakers. In Philadelphia — where charters already serve 70,000 students, or one-third of public-school enrollment — critics say the schools drain district resources without showing consistent achievement. Supporters, meanwhile, say the district doesn’t demand the same from its own schools. But for some Philadelphia parents, charter schools have a more straightforward connotation: They’re not the traditional public schools. “The quality of the education in regular public schools is just not what it used to be," said parent Lorene Whiting. No one previously gathered such system-wide data, so determining a trend is difficult. The school district ultimately approves charter schools’ growth. But the new application system is expected to make it easier for parents to apply to charters; some charter school operators said they have already noticed an uptick in applications. The suspense will soon end: Participating schools holding lotteries must notify students if they were accepted or wait-listed by Feb. 19. District officials say Philadelphia’s public schools are improving — notching four straight years of growth on the district’s performance metric. But “people are driven often by perception," said Farah Jimenez, president and CEO of the Philadelphia Education Fund, and former member of the state-appointed School Reform Commission that until last year governed the district. “The challenge is that [the school district] has to overcome a legacy of a narrative that says our district schools are not faring well by our students,” Jimenez said, though she noted that quality could be uneven. The perception problem was apparent among parents interviewed at charter lotteries in the last few weeks. Even though some city charters have had as many or more problems, academically and otherwise, than traditional public schools, parents seemed to view charters as synonymous with a safer, more orderly, and generally better school. “I’m just trying to get my kids out of public school,” said Jamie Bell as she left the Northwood Academy Charter School lottery on Feb. 1. Bell’s children, entering first and fourth grades, didn’t get seats at the school, but were waiting to find out about other applications. “I picked so many," Bell said. She also applied to Wissahickon Charter School in East Germantown — a haul from Bell’s home in the Northeast, but a hurdle that she and other charter parents seem willing to accept. “I’ll do it if I got to,” she said. Rachel Pagan’s son didn’t get into kindergarten at Northwood, but was accepted into the Philadelphia Charter School for Arts and Sciences, a former district school in Frankford converted into a charter in 2012. As a Renaissance charter, it must give enrollment preference to students in its surrounding area. “I’d rather him go to a charter than public” school, Pagan, who lives in Frankford. Nearly 1,000 incoming kindergartners applied to Northwood — which describes itself as a “learning sanctuary” — for only a few dozen available seats. It’s unclear how many students are on charter school wait-lists across the city or how many open seats there were. Philadelphia School Partnership, the nonprofit that ran the new application system, said it didn’t collect such school-level data. But some schools agreed to share their application numbers and openings, including MaST — a nationally recognized charter in Somerton with a more affluent population than the district as a whole. With more than 12,700 applications, the technology-focused school was the most sought-after charter in the new system. At MaST’s lottery on Tuesday, parent Nithya Hari, who submitted applications to all three of MaST’s charters, said she wasn’t considering the traditional neighborhood schools near her. On the school ratings website run by Philadelphia School Partnership, she said, they only scored a 6 out of 10. “I’m looking for score 8 and above,” Hari said. Like other charter schools, MaST gives admissions preference to siblings of current students, which is how Nathan Martinez landed at number two on the wait-list for fourth grade. His older brother, David, started at the school this year in ninth grade. The family had applied six years in a row, said his mother, Jennifer Martinez. Nathan also attended Catholic school near their Somerton home, but transferred to a district school, Comly Elementary, when his brother got into MaST. “We were pleasantly surprised” with the school, but it only goes to fifth grade, Jennifer Martinez said. Nathan Martinez and parents Jennifer and Dave Martinez felt optimistic that Nathan was number two on MaST's waiting list for incoming fourth graders after Tuesday's lottery. Education experts hope steps like the uniform application system might provide insight into the demographics of applicants, and why parents are looking to charters — and why they eschew their neighborhood public schools. That information could not only help the charters but be invaluable to the school district. Susan DeJarnatt, a law professor at Temple who has written about charters, said many parents still want their children to attend traditional public schools in the city. She noted the “heartbreak and agony” school communities went through in 2013 when a wave of schools closed. Lorene Whiting wasn’t conflicted about her choice. She wanted her son to get into Northwood Academy. On Feb. 1, they attended the school’s lottery. The school had only 82 available seats for kindergarten — and 45 were reserved for current students’ siblings. When the list rolled out, Kendrick was number 133. Probably too far down on the wait-list to expect he’ll be there this September. As the lottery ended, Whiting and her son lingered for a few minutes on the gymnasium bleachers. Resigned, she gathered their belongings, and grabbed the bag of cheese curls Kendrick had been eating, and wiped his fingers.